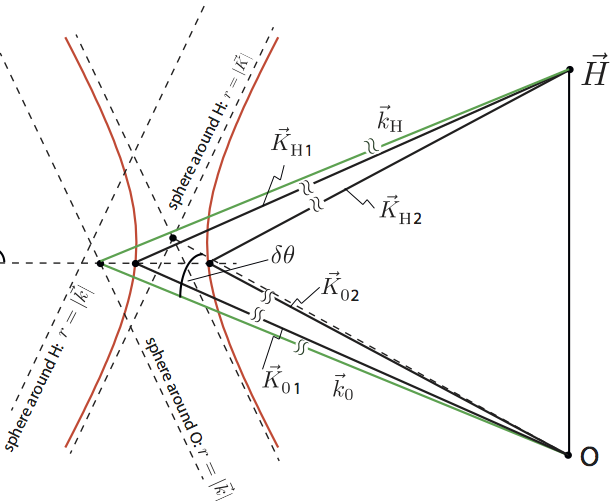 In the framework of the dynamical theory of diffraction there are two problems to be solved: The first is to find the conditions under which a wave field can exist in, and travel through, the crystal, which is an extension of optical theory of dispersion. The second problem is that of connecting the fields inside the crystal to those outside, which includes also the incident wave – the answer is the theory of refraction and reflection. Compared to the geometrical theory, the dynamical theory of diffraction accounts for the spatial periodicity of the interaction potential in perfect single crystals. Thereby the Schrödinger equation has to be solved taking this potential into account 3 4. When neutrons illuminate a perfect crystal under near-Bragg orientation conditions, the dynamical theory of diffraction predicts a coherent splitting of the incident wave into four components, with two travelling wave components passing within the crystal in the Bragg direction and two components in the forward (incident) direction. P. Ewald has shown in his historic investigation of the dynamical theory of X-ray diffraction, which in turn characterizes neutron diffraction as well, that this splitting will result in a periodic beating of radiation density travelling in either the Bragg or forward direction at different depths in the crystal, this feature being described as a Pendellösung structure. Generally a crystal is made up of atoms arrange in a three dimensional periodic structure, describes by the linearly independent vectors and . If we move in the crystal along a linear combination we arrive at a point with similar surroundings compared to the point before the lineare translation . If we now remove all atoms and only keep the mathematical (point like) structure the result is the Bravais lattice. In addition to the (direct) Bravais lattice described by the basis vectors a reciprocal lattice with lattice vector , where are the Miller indices, and basis vectors , and with being the volume of elementary cell given by . In the reciprocal lattice the Bragg condition reads , where denotes the incoming and the refracted wavefront, respectively, which is illustrated schematically below on the right side, in comparison with the usual formulation of Bragg’s law , illustrated in the middle. The general difference between Laue and Bragg configuration is illustrated below on the right. Single crystal plate: The neutron wave function inside the silicon perfect crystal is deduced by solving the stationary Schrödinger equation for the time-independent crystal potential denoted as , where the potential is given by the sum over all nuclear scattering centres located at and with being the mass of the neutron. See here for crystallographical details of the silicon diamond lattice. The vector of lattice position is given by , where denotes the vector from origin to elementary cell and is the vector from origin of elementary cell to position of atom in cell expressed as . Here are the lattice vectors of an elementary cell and are rational numbers between 0 and 1. Since the crystal potential is periodic it can be transformed into reciprocal space by calculating the Fourier transformation of the crystal potential as follows: , where denotes the lattice factor and the structure factor. The lattice factor is given by , where Number of elementary cells and is a reciprocal lattice vectors with , where are the Miller indices, where , and with being the volume of elementary cell given by . The structure factor is calculated using the definition and as . As a simple example, we consider a body-centered cubic crystal system, with and which yields . Now we consider the (2,2,0)-reflexion of the face-centered cubic lattice of a silicon single crystal, which is (is explained above in detail) of diamond lattice type. Then for (e.g. silicon in -direction) and for all odd/even (e.g. silicon in -direction). we get , eV. For thermal neutrons with energy of about eV the ratio between the potential and the energy yields . The inverse Fourier transformation of the potential is given by , which describes the periodicity of the potential in the crystal lattice.